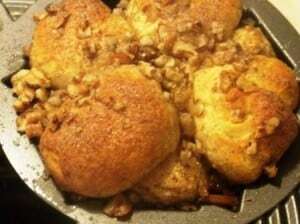 You didn’t miss out on the first Monkey bread redo that I tried out did you? If so, you can find Lumpy Pumpkin Bites already live. (Can you tell the kids helped me come up with names for the redos? LOL!) This Nutty Chimp Bread one isn’t nearly as sweet as the others, but is still really yummy. Seems like a great coffee cake type recipe. Separate your ten biscuits into 20 smaller ones. Roll each piece into a ball. Combine Sugar and Spices in a ziplock. Working with a few balls at a time, stick them in the ziplock and shake to coat the balls in the spice and sugar mixture. Place 1/2 of the coated dough into a bundt pan and sprinkle about 1/2 of the chopped pecans over the top. Then sprinkle a few tablespoons of the mixture over the top. Mmm! 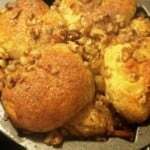 Nice twist on the usual monkey bread and I love the cute name!